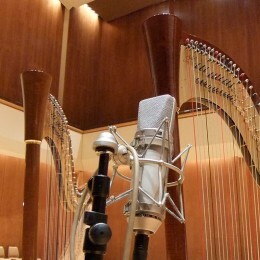 The Atlantic Harp Duo is looking for someone to be the “voice of Ariadne”. As the development of Ariadne Rediviva progresses, it will soon be time to record the narration for use in the show, and we need to find the right voice for this role. That’s why we’re reaching out to you, to ask if you would like to be a part of this project. This narration will be the central element of a full-length, multi-media show, produced by the Atlantic Harp Duo: Ariadne Rediviva. The show tells the story of Ariadne, from ancient mythology. The narration is an original epic poem, about 20 minutes in total, which recounts the most important episodes of Ariadne’s life: her beginnings as a princess of Crete, aiding Theseus to defeat the Minotaur in the labyrinth, her abandonment on the island of Naxos, and then her marriage to Bacchus, the god of wine and revelry. To read more details about the show, visit Ariadne Rediviva. We want the reading of the narration to create a storybook atmosphere for the audience. We are searching ideally for a female narrator, with native or near-perfect English, who speaks with an “international” accent (non-region-specific). We are also hoping to find someone who loves telling stories and whose expressive interpretation will capture listeners and draw them into the story. If you are interested in recording with us, please let us know! We would love to hear your voice and see if it matches the feel that we’re looking for. Send a message to info@atlanticharpduo.com and let us know that you’re interested. We will then send you the first few paragraphs of the show’s narration. You can read it and get a feel for the kind of storytelling it will be. You make a sample recording of yourself reading the narration and send it back to us. Once we have found the perfect voice for this project, the final recording will take place sometime in June, at a date that is convenient for you. If you live near Utrecht, then your recording session will be hosted by Elizabeth. If you live near Paris, then your recording session will be with Marta. If you live somewhere totally different, this is still possible as long as you have access to professional recording equipment and a quiet recording space. two free tickets to the premier of the Ariadne Rediviva show in your area.